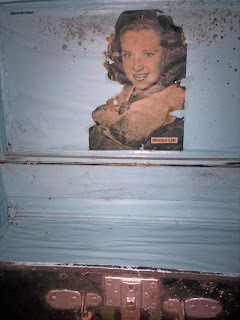 Above we have a photo of Priscilla Lane pasted on the inside cover of a young man’s footlocker. The footlocker was part of his equipment as a member of the Civilian Conservation Corps during the Great Depression. This particular footlocker is on exhibit at the Civilian Conservation Corps Museum in Stafford Springs, Connecticut. See my post on New England Travels for more on this museum. It brings to mind something we discussed a month ago in this post about there being few old movies that dealt with the subject of polio. Not addressing the treatment of polio and the frantic search for a vaccine in the years in which it was so rampant and so frightening, to me is like cranking out a slew of movies during the early 1940s and hardly mentioning World War II. Seeing the pretty young face of movie ingénue Priscilla Lane on the inside of this CCC boy’s footlocker brings another realization. I don’t believe I have seen the Civilian Conservation Corps even mentioned in a movie from the 1930s. The film industry covered a lot that was topical back in the day, as we know, even if sometimes to gloss over issues. But to never bring up the CCC is amazing. President Franklin Delano Roosevelt initiated many programs during the Great Depression, and most were fairly controversial among Republicans in Congress, but we’ve all seen many films with the “blue eagle” logo of the NRA (National Recovery Act) plastered like an imprimatur on the end of the film. That the very controversial NRA was afterward nullified does not erase it from the history of American film of this period. Young people can still notice it, and ask what that meant. Conversely, the CCC, though not supported by Republicans as much as by Democrats, nevertheless achieved a slight majority in favor even among Republicans. It was easily FDR’s most highly regarded program. If representing the CCC might seem too political for some studios, one would think that Warner Bros. at least would have a take on it, being more apt to present more gritty films during the Depression and stances supportive of the then current administration. They gave us “Wild Boys of the Road” (1933). There would have been a lot more wild boys of the road if not for the CCC. The Civilian Conservation Corps put thousands of young men into thousands of outdoor camps to work in forestry, the establishing of state and national parks, conservation, public works projects, and even helped out communities during floods and fires. The money they earned that was sent home supported thousands of families during the bleakest years of the Depression and kept them from starving. 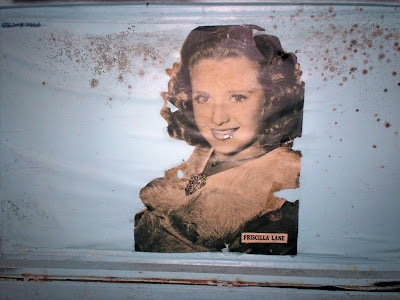 The boy who pasted Priscilla Lane’s picture in his footlocker is unknown to us. The only thing we know about him is he loved Priscilla Lane. He probably went to the movies on his pass to go to town. Maybe he went to see “Four Daughters” with Priscilla Lane, discussed here in this post. If you know of any old movies where the CCC was depicted or even mentioned, please let us know. I’d love to know if there were any. That's rather amazing, but I can't think of a film with the CCC. Wow. Hi, John. It does seem odd, doesn't it? Maybe someone else can come up with one. The CCC is well represented in film shorts, just not in feature films. On the other hand, a full length feature about the fact that the government had to create jobs for people may not have been something people wanted to be reminded of. Since the CCC was mainly for young men from families on relief, maybe there are B movies about the Corp aimed at younger people. I'm sure there is something out there, surely made by WB. My father would have been eligible to join the CCC during the depression and he said people did it because there was no other option. (He always managed to find work.) Young men wanted a regular "real" job, not a relief job. Right or wrong, that was the feeling of the time among many ordinary people (aka film goers). If there is a dearth of feature films with the CCC, then it represents what the public did not want to see. Thanks for stopping by, Panavia, you make some interesting points. The stigma of being on relief could have been a sticking point for some of the audience who didn't want to be reminded of it. My father was in the CCC and he was grateful for it, and, like many ex-CCCers, proud of being a member. But not everybody, as you state, might feel the same way. It still seems unusual for the subject not to be broached in a feature film, but the suggestion of relief work not being a popular subject is certainly valid. I'm glad your father had pleasant memories even in those hard times. Thanks for sharing them with us. What a fantastic post! Absolutely fascinating. I enjoyed this post too, Jacqueline. My grandfather was from a large family in Oklahoma and was in the CCC for a while. One of the family stories was about his brother who was secretly married but when the CCC found out -- a letter arrived at the camp addressed to "Mr. and Mrs." -- he had to leave the camp and the Corps. My grandfather had a rather "Grapes of Wrath" experience in the Depression -- he and my grandmother arranged transportation to CA by driving a car out here for a dealership. Most of their family eventually ended up in California. At one point they were down to just a bit of cabbage in the house. The happy ending is that my grandfather ended up being highly successful in two different businesses in CA, including owning a chain of grocery stores and being president of the CA grocers' association. I love the bits of "real life" you search for in movies and think it's rather fascinating that you have zeroed in on something that was a big part of '30s life yet pretty much avoided by films. I'd love to know if anyone turns up any titles. Laura, your family story is fascinating, and thank you so much for sharing it with us. Their life experiences gave our grandmas and grandpas some interesting stories to tell. I suppose what it comes down to is life is an adventure no matter when or where you live. Maybe they don't all make good movie plots. Maybe it's all in the telling. The CCC seems largely to be a story untold in terms of a fictional plot, though documentaries and non-fiction books have been written about it. I hope other readers will continue to lend their input. Thanks so much for yours. So far, this is all I can find: OOppps, can't paste the link. I'll email it. 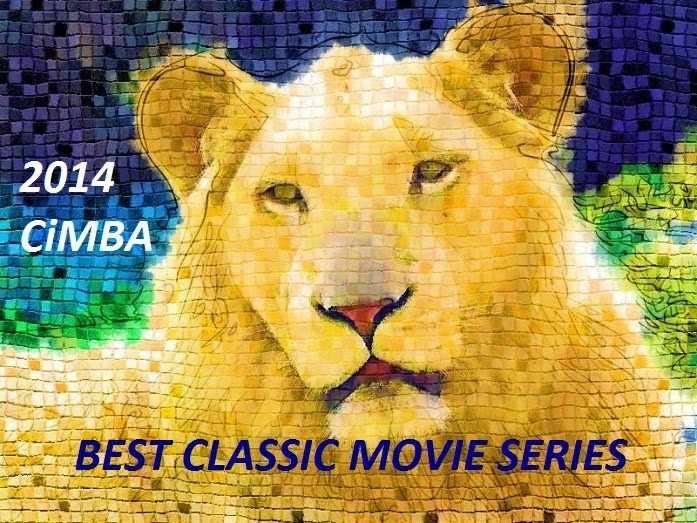 Tony, thank you so much for your link to "Pride of the Bowery" (1940). The movie, now in public domain, can be viewed here free: http://www.archive.org/details/pride_of_the_bowery. I'll watch it as soon as I can and re-visit the topic. 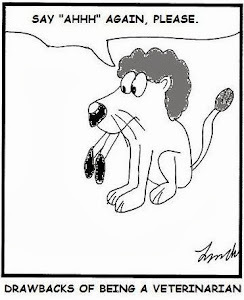 Thanks again, Tony (and Clyde), and welcome to the blog.